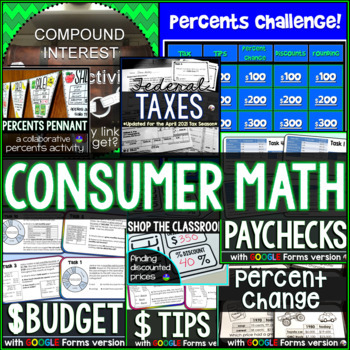 This bundle includes a variety of activities for teaching financial literacy in a consumer math class. From tipping to filing taxes to working with integers when balancing a checkbook, this bundle includes activities that will strengthen student understanding of finances and how to work with percentages. You can see all of the activities included in this bundle by scrolling down to the bottom of this page or by clicking the links below.